Mr. Omelette is a family owned business that has brought delicious and unique catering options to the public for over 25 years. If you are looking for a Thousand Oaks breakfast catering service, you can rest assured that you will be in experienced and professional hands with us. We are equipped to cater many different types of events such as, corporate events, parties, weddings, luncheons and more! Make your next event one that your guests won’t forget for years to come by choosing one of our fresh and exciting breakfast catering menus. We specialize in breakfast catering and offer many different options depending on your budget, size of event, and and your menu preference. We make our hot and fresh omelettes, crepes, waffles and more right before your guests eyes. Choose one of most popular menus for your next event in Thousand Oaks. Corporate Special – Our most valued and popular package. 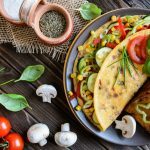 This package offers hot, fresh omelettes, with your choice of a selection of breads, beverages, and desserts that are sure to leave an impression. Executive Corporate Special – This package is sure to “wow” with a Homemade Vegetable Frittata, choice of breads, beverages, and desserts to fill your team up. Recession Buster Special – This special includes a selection of fresh omelettes, breads and beverages created specifically for your corporate event needs without breaking the bank. 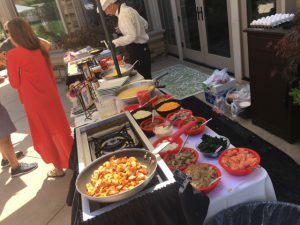 Cocktail Party – Mixing and matching our hot and cold hor d’oeuvres is one of the best ways to utilize our cocktail parties. Espresso Cappuccino Bar – We use only the finest Lavazza beans to make all of our specialty drinks. All of our drinks are made to order by our trained barista staff. We also offer drink enhancements at no extra charge. We offer tea and non caffeinated beverages as well. Smoothie Bar – We are happy to provide a healthy option for your next event in Thousand Oaks. Choose drinks that are both delicious and good for you by having our Smoothie Bar at your next party. Planning the menu for events can be stressful, but it doesn’t have to be. Mr. Omelette can take care of the menu while you take care of the rest. Call one of our catering consultants to see how we cater your next event in Thousand Oaks, CA. 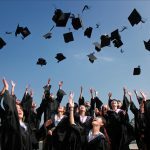 Looking For Catering For School Graduation Parties? Mr. Omelette Has You Covered!